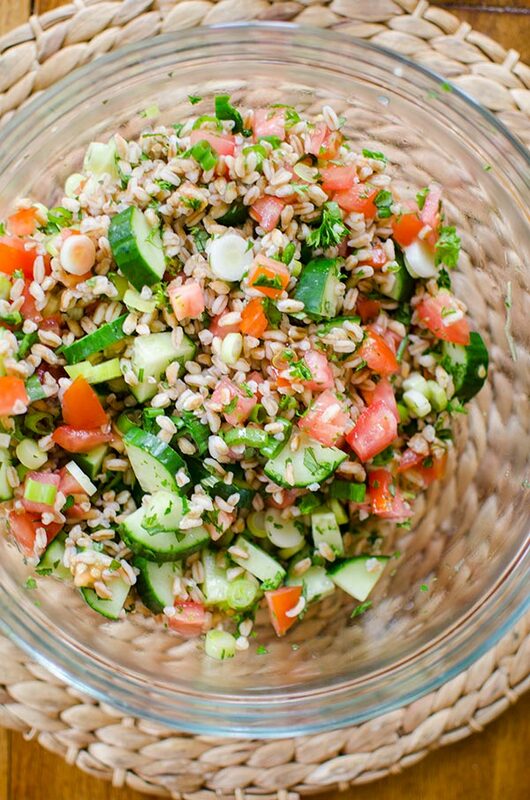 A traditional tabbouleh salad gets an update using farro for a simple and healthy farro tabbouleh salad. I’ve been a fan of farro since last summer, it’s one of my go-to grains when I’m making a salad because it’s really hearty and loaded with flavour. I made a charred corn and farro salad last year and have been planning my next farro recipe ever since. I used it in a lot of winter salads this year, but I never ended up sharing them (making a mental note for January). This farro tabbouleh came about when I was planning on a making a quinoa tabbouleh salad, only to realize that I was completely out of quinoa. Luckily, I had an unopened box of farro in the cupboard and this salad was born. I think this was a sign from the Universe telling me that it was about time I posted another farro recipe! Whenever I get an idea for a post, or something I want to talk/write about, I jot it down in the notes on my phone to save for later. I was going through this list recently for some inspiration and stopped when I read the line: what does it mean to live up to your potential. Seriously, what does it mean? I’ll start by saying that I absolutely hate that statement “live up to your potential”. Do you hate it too? It leaves such a bad taste in my mouth because it is such a loaded statement. Loaded with judgment and expectation. Who is anyone to say what your potential is. How do they know? I don’t think I’ve ever had someone explicitly say this to me, but I’ve definitely been in situations where I have let people down. I think everyone has. During my final year of university I ended up changing my thesis halfway through the year. This was a pretty complex situation, not only was the project itself a huge undertaking for one person, but there were also a few really difficult things going on in my life at the same time. Was I worried that I was letting others down by changing my thesis? For sure. Was I worried that I was letting myself down? You bet. But in the end, with the support of a wonderful professor, I made the decision that was right for me and lead me down a healthier path. This salad takes the traditional flavours of tabbouleh, a cracked wheat salad with finely chopped ingredients and fresh herbs, and uses trendy farro as the grain, with a simple vinaigrette made of olive oil and lemon juice. Cook farro according to package directions. Cool. In a large bowl, whisk ingredients for dressing. Add farro, tomato, cucumber, onion and herbs. Toss and serve. 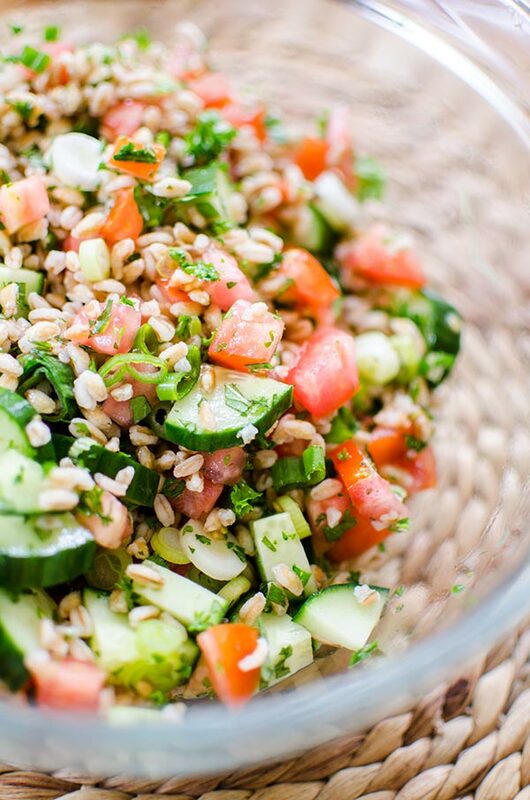 Let me know if you give this farro tabbouleh a try in the comments below. Great fresh ingredients in here! Hi! Just came across this recipe from College Prep's email! It look awesome and I love farro and farro salads but the last time I ate one I was hungry later! I see that this makes 4 servings. Would you typically eat one serving of this at lunch or more than one? Maybe that's a dumb question but thanks! 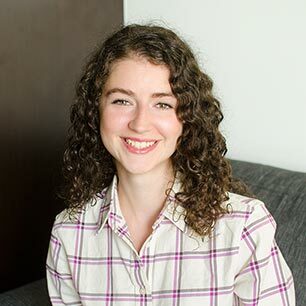 Hi Jana, I would typically eat one serving at lunch along with a few other things--usually an apple, some nuts and veggies and hummus for extra protein! I can't wait to try this! I usually make my lunches the night before. Is it ok to put the dressing on this ahead of time or will it be soggy when lunchtime comes around? Thanks Carrie! Yes you can definitely put the dressing on this dish ahead of time, the farro holds up well! In fact it'll add even more flavour. I hope you enjoy!